Thank you for visiting JohnBriggsBooks.net, where I’ll keep you updated on my publishing news, events, book releases, and the like. I’ll also offer my thoughts on the publishing industry (particularly children’s books) and social issues as they relate to my books. I’ll even throw in some writing advice gleaned from my two decades as a book and magazine editor. And if you’ve got any young readers in your life, please check out my middle-grade biographies on Judy Garland, Pete Seeger, and civil rights hero Mary Dyer, as well as my picture book Leaping Lemmings! 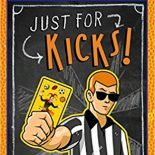 And don’t forget to check out my two upcoming Fall 2018 releases--Just for Kicks! 600 Knock-Out Jokes and Monster Madness: 600 Frightfully Funny Jokes (both from Sterling Children’s Books). I hope you pick up your copies when they come out! Keep your young reader happy with information on upcoming books. You will not be spammed, and your information will never be sold. The only updates you will receive are for new releases. Keep your middle-grader up to date! This entry was posted on June 4, 2014 by johnbriggsbooks in Uncategorized.